The protection plate is hinged on top of a piston that passes through the capo, through a thin break lever. The bottom end of the piston is fastened to an operating lever. 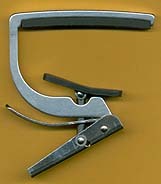 The break lever is hinged in one end and is forced away from the capo by a small spring. 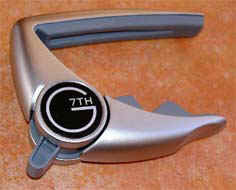 The piston can't move in the opening direction unless the break lever is pressed towards the capo. Made of titanium and stainless steel. US patent 1996 by Todd A Roblee. The wrap spring clutch mechanism inside the pivot is a modified design used in printers and copiers to provide a decoupling and overrun device. It allows the musician to squeeze the capo up to exactly the desired tension and release it with the small lever sticking out from the pivot. The arms are diecast zinc. Invented 2002 by Nick Campling, UK.